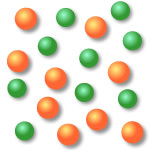 Relative mass The ratio of the average mass of atoms of an element compared to the mass of a carbon-12 atom. to calculate the relative mass Multiply each percentage by the mass number. Add and then divide by 100%. An atom is the smallest amount of a substance that can take part in a chemical reaction. Elements are arranged in a periodic table in order of increasing atomic number. 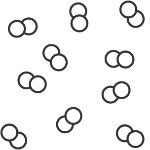 Elements with alike properties are in the same column (group), and elements with the same number of electron shells are in the same row (period). for example if you have an element on the third row down in group seven: it will have three shell and 7 electrons on its outer shell. resistance to changes of shape or total space occupied. For example unlike a liquid because it does not change shape in a container. Freezing when a liquid becomes a solid. the molecules of a liquid slow down (and decrease in energy) so their attractions cause them to arrange themselves into positions as a solid. Difference between boiling and evaporation. 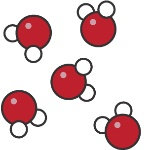 Evaporation occurs at any temperature and is a slow process and takes place only on the surface. Boiling is a fast process that takes place throughout the liquid the temperature is fixed and thermal energy is supplied by a heat source. Example of gases diffusing. In a experiment two pieces of cotton wool are placed on opposite end of a glass tube the tube is sealed. On one end the cotton is soaked in ammonia solution the other cotton wool is soaked in concentrated hydrochloric acid.A ring (where the two gases meet) usually forms nearer to the hydrochloric acid because it diffuses more slowly than ammonia this is because hydrochloric acid is almost twice the molecular weight of ammonia and the rate of diffusion is corresponding to the molecular mass of the gas. Any substance that contains only 1 type of atom. Cannot be broken down. Made up of 2 or more different elements/compounds. Can be separated. Atoms of different elements can join together in chemical reactions to form compounds The properties of compounds are commonly much different from the properties of the elements they contain. Can be broken down. Separating a solute or solvent from a solution two liquids with different boiling points can be separated. As the liquid being produced is heated, the vapors that form will be highest in the part of the mixture that boils at the lowest temperature then what rises condenses and liquid is collected. separates several solutes dissolved in a solvent travels different distances on the paper. Example analyzing food colouring separate out mixtures of coloured dyes.Chromatography is used to separate mixtures of substances into their components. Fractional distillation is mostly the same as simple distillation however the fractionating column is placed between the boiling flask and the condenser. The substance in which the solute is dissolved is called a solvent. The substance which is dissolved is called a solute. A solution in chemistry is a mixture of two or more substances. solubility is measured by figuring out the maximum mass of a solute that can be mixed with and became part of a liquid (dissolve) in 100 g of a solvent at a given temperature.this is plotted between the temperature and solubility of a particular solute in an solubility curve.